"This is a very simple and yummy side dish. I learned in while living in France from an old Mediterranean lady. This is always a hit!" Core and slice the tomatoes, and arrange them in a serving dish. Sprinkle the shallots over the tomatoes. 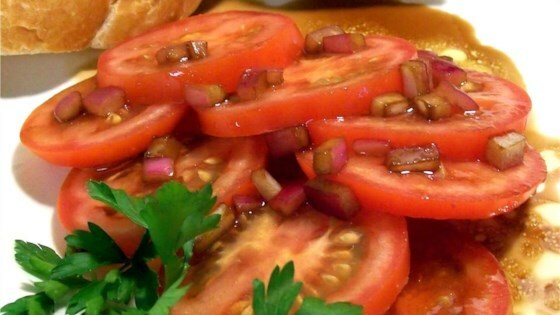 Whisk the olive oil and balsamic vinegar together with a fork, then pour over the tomatoes. Let stand for 5 minutes before serving, or refrigerate, covered, for up to 3 days. Eat with French bread, and dip the bread in the marinade when finished with the tomatoes. Great recipe and simple too...Perfect for Summer..I used Olive Oil that has been flavored with a crushed garlic clove and it added just a little extra.